The numbers are out, but the numbers behind the published numbers will startle you. Yesterday the Bureau of Labor Statistics released the latest numbers on national unemployment rate; but the government also released numbers on Metropolitan Statistical Areas which include New Orleans and is included in this analysis. What Are Metropolitan Statistical Areas? 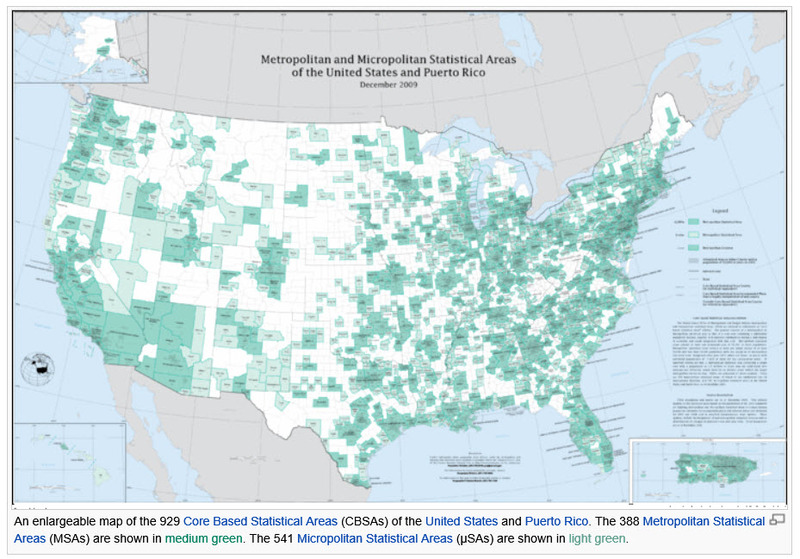 The Office of Management and Budget defines statistical areas for the metropolitan and micropolitan areas of the United States and Puerto Rico. Most recently, the OMB defined 1098 statistical areas, of which, 388 are Metropolitan Statistical Areas, 381 for the U.S. and 7 for Puerto Rico. A Metropolitan Statistical Area is one or more adjacent counties or county equivalents that have at least one urban core area of at least 50,000 population, plus adjacent territory that has a high degree of social and economic integration with the core as measured by commuting ties. The other side of the story is that there has been a massive withdrawal in the number of people looking for jobs, which affects how the unemployment rate is calculated. The chart below shows the labor force participation rate is at its lowest level in ten years. 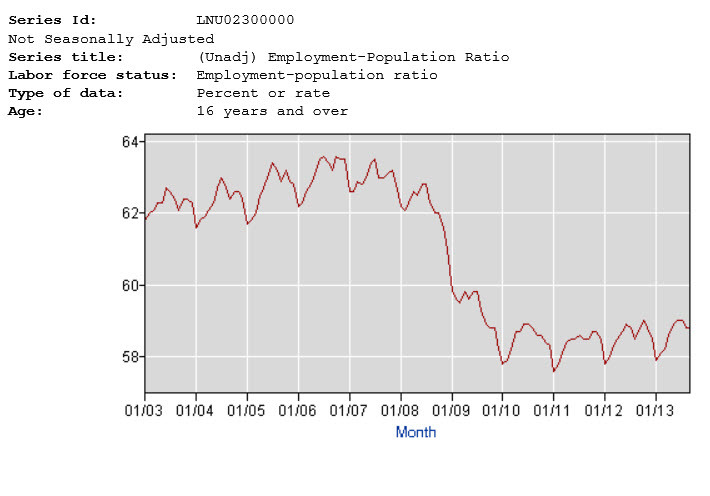 The numbers for the people employed compared to the population show we are still near a ten year low, as shown in the chart below. What Is The Real Number On Labor Force Growth? The labor force since 2010 has grown from 153 million to 155.5 million. 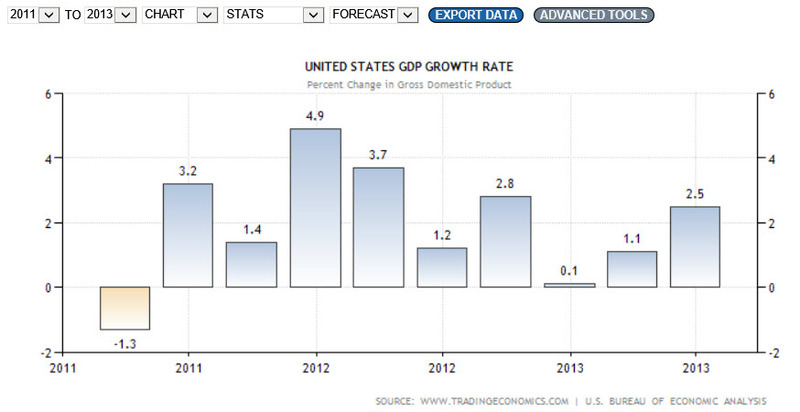 That is a growth rate of 1.6 percent over 33 months, or 0.58 percent annual growth, as shown in the chart below. Unemployment for the New Orleans-Metairie-Kenner MSA was worse, at 7.2 percent for August 2013, compared to 6.9 percent in August 2012, and was the opposite of a positive trend witnessed by the State of Louisiana which experienced unemployment of 6.7 percent for August 2013, compared to 7.9 percent in August 2012. 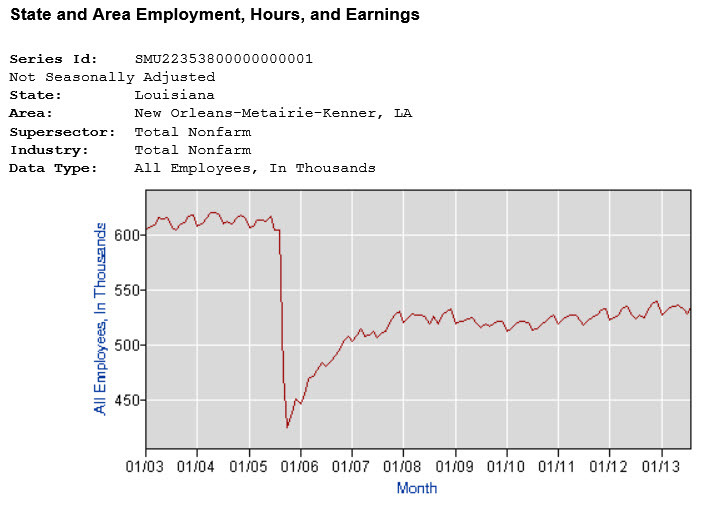 The New Orleans MSA recorded 547.3 thousand workers in the civilian labor force, which, as shown in the chart below, has recovered some since Hurricane Katrina. 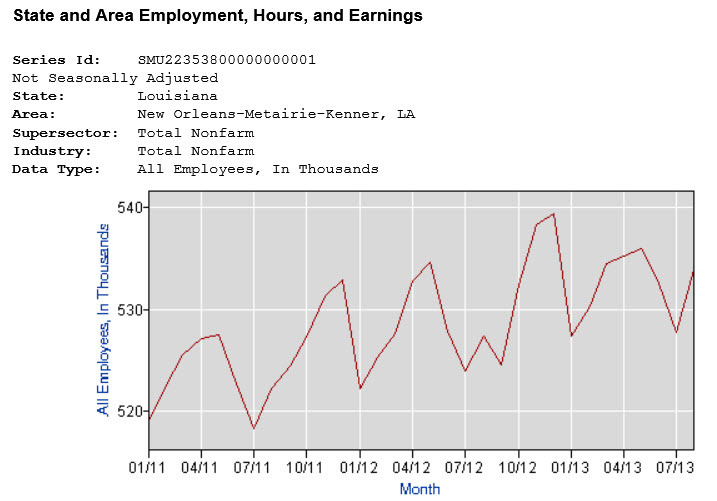 Since 2011, New Orleans MSA employment has increased from 520 thousand to 533 thousand, a growth rate of 2.50 percent total, or approximately 1 percent annual growth in employment, as shown in the chart below. The reason we look at these numbers is to try to figure out if there are more people getting jobs which drives the economy in the future. The answer is yes, there are people getting jobs but there are also more people leaving the labor pool because they giving up or unable to find jobs. This makes sense in an economy where GDP was 2.5 percent growth in the 2nd quarter 2013 compared to the 1st quarter 2013, and 1.1 percent for the 1st quarter compared to the previous quarter, as shown in the chart below. The number that makes the most sense is not a rate or ratio but how many people are in the labor force and how has that grown. 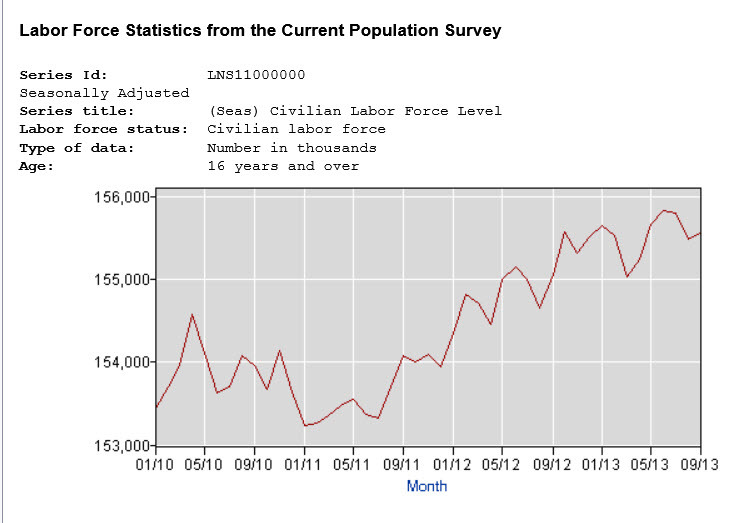 The answer is the above chart on labor force growth is 155.5 million with a growth rate of 0.58% annually since 2010. The prudent and logical conclusion is that, even though interest rates are at their lowest levels in decades, we will continue to have a slow economy for several years, maybe even a decade. In a slow growth environment, cash flow from assets should do very well, and the conclusion is that New Orleans commercial real estate producing income from 5 percent to 10 percent can easily be found today, generating a real return over inflation of between 3 percent and 8 percent which historically beats any other asset class over the last decade.